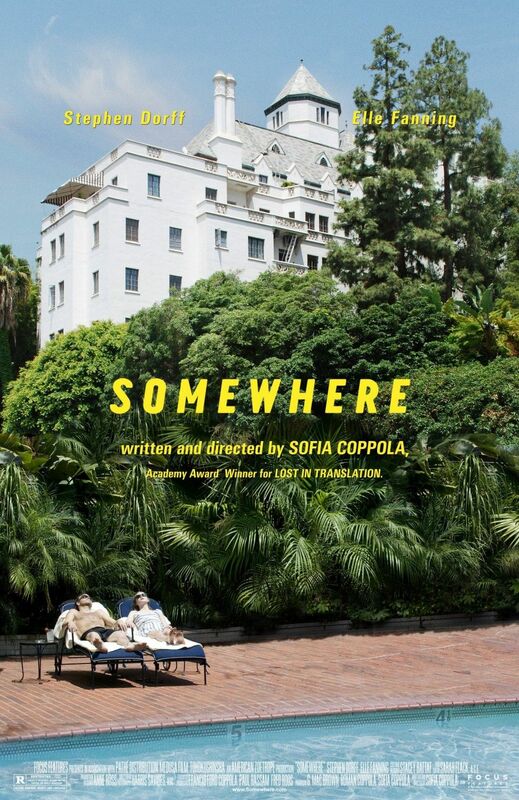 LADY-DIRECTED DECEMBER #2: Somewhere (2010) – dir. Sofia Coppola | Films Like Dreams, Etc. As far as I can remember, I have always been an adamant supporter of Sofia Coppola as a filmmaker. The Virgin Suicides was the first film I saw of hers and I immediately admired the style and grace with which she presented the story of the Lisbon sisters. Then I, like pretty much everyone else, fell in complete awe over the splendrous beauty that is Lost in Translation, forever making me yearn for a night of karaoke in Tokyo. Furthermore, Marie Antoinette, while not her best film, is easily her most interesting and boundary-bending. Recently, I watched her Somewhere for the first time, making Coppola’s latest The Bling Ring the only one I’ve yet to see. With that introduction, it must be said that Somewhere is the very first from the filmmaker’s repertoire that left me a bit disappointed. For the first time in her filmography (though I haven’t seen her short films), Coppola places in the center of her narrative a man, Hollywood actor Johnny Marco (Stephen Dorff). The trajectory with which the story goes is that of an aimless, tedious existence and feels very familiar, as if Coppola had desired to make a second Lost in Translation. Yet while such films could make for an interesting character study or even a catalyst for existential contemplation, the film itself felt just as aimless as its protagonist. Its episodic pacing does try hard to humanize this superficial character, but I remained almost fully unconvinced; thus, this is probably one of the weaker scripts I’ve seen from the artist. Exceptions to this factor do arrive with interactions between Marco and his young, long-estranged daughter Cleo (played by the marvelous Elle Fanning). Such moments light up the screen with an intimate organic chemistry, the likes of which are seldom to be found when we’re forced to endure Marco on his own. I’d like to say a few more words about Fanning, because I do believe she may be the best thing about this entire film. As I’ve implied before, Somewhere feels much like a less humanistic Lost in Translation, yet Fanning remains one of its only saving graces. Her ability to transcend being a typecast “little girl” caricature makes her easily the most interesting character in the narrative and her talent cannot be denied. Honestly, this may be a much better movie if the plot was shifted more toward her perspective, given that Coppola has written so many fascinating female protagonists in the past and would definitely do Fanning justice by placing her as a lead. Other than that, Somewhere contains a lot of elements that are not uncommon to be found in other Coppola flicks. For one thing, it has some familiarly ethereal coupling of a dreamy music score with fascinating cinematography and beautiful imagery. Continuing along Marie Antoinette‘s line of orbit, it also contains some rather interesting choices in soundtrack – although perhaps not quite as radically quirky as the former. As mentioned before, it has much of the relatively languid pacing that Coppola typically employs; however, in here, unlike in others that came before, this can often operate to a fault. The realism is implemented in a degree to make the characters feel real, and in this sense it does its job completely fine. The only problem is that they’re not the kind of people one wants to hang out with for too long. They’re selfish, boring, and definitely overstay their welcome. This is made worse in the fact that the pacing of Somewhere makes the film feel twice as long. It’s certainly a blessing that the film provides us such a charismatic young girl and some awfully beautiful photography to even out these indifferences and give all of us a reason to keep watching. This entry was posted in Lady-Directed December, Reviews and tagged 2010's, Lady-Directed December, Sofia Coppola, Somewhere. Bookmark the permalink. I had similar problems with not caring about the characters in The Bling Ring, though there’s still a lot of artistry from Coppola. I liked Somewhere more, though the big hurdle is caring about Marco. I found everything else to be very interesting, especially Fanning and the world that Marco inhabits. It’s also a gorgeous film and includes amazing shots (especially the underwater scene with father and daughter). It’s still in the lower tier for Coppola, but I think there’s enough there to still make it really interesting. Great post. I have not seen this film yet but i love sofia coppola. Her films are like dreams!